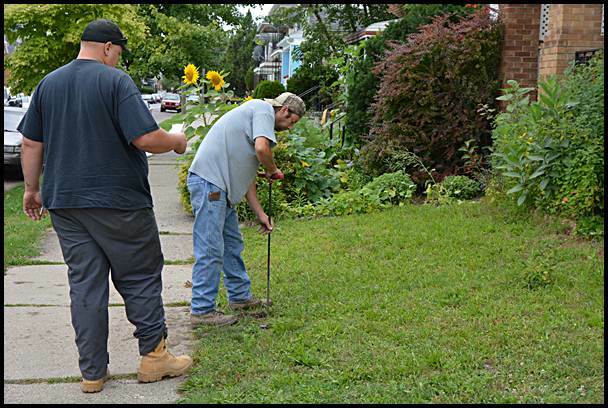 City contractors turn back on water service to a household on Evaline St. after the property owner paid a long overdue water bill. Remember how for years you’ve heard the city is going to crack down on those pesky overdue water bills? On Tuesday, the city finally came out in force, shutting off water to about 50 dwellings and businesses. Acting City Manager Kyle Tertzag said Emergency Manager Cathy Square has made it a priority to collect over $600,000 owed to the city. “It’s money that’s sitting out there that crippled the city’s ability to maintain its infrastructure – which has resulted in basement floodings,” Tertzag said. Tertzag has been acting city manager for about one year. Tuesday’s water shutoffs resulted in an immediate rush of property owners coming into city hall to pay their bills, or at least start a payment plan. Tertzag said Tuesday’s shutoffs prompted a number of people who knew they were delinquent but didn’t want to face a water shutoff to make good on their bills. “People came in droves to pay their bill,” he said. Some of the bills totaled $3,000, $5,000 and even $8,000, Tertzag said. Those who did pay their bills on Tuesday got their water turned back on that day or the next day at the latest. Tuesday’s shutoffs also caught the attention of WXYZ Channel 7 news. That’s because Sharian Lloyd called to complain about the alleged treatment some received in city hall. Lloyd, who owns a rental dwelling in Hamtramck, came to pay her bill but witnessed a water department clerk treat a non-English speaking resident rudely. “My beef is this: It was chaos. The lady was yelling,” Lloyd said. Tertzag scoffed at the notion of anything resembling “chaos” in city hall. He said that those paying stood quietly in line and that there were enough clerks to handle the rush. He added that the city has been shutting off water service to about 10 households and businesses a day for the past several weeks. The reason 50 were turned off on Tuesday was that it did not require digging up part of the street and that the weather cooperated. Water funds can only be used to pay for the water and sewer service provided by Detroit and to reinvest into repairs and maintenance. In other words, the city cannot dip into the fund to pay for other city services. The problem is two-fold: first, they didn’t treat all delinquences from years past the same. SOME were sent to tax rolls, while others were allowed to accrue to yesterday. Somebody knew somebody at City Hall for that happen. 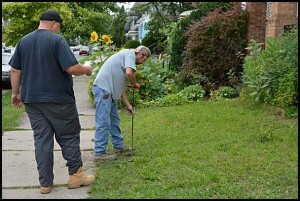 Same with the weeds violations sweep last year this time. The worst offenders had connections and therefore look today exactly like they did in September 2012. Secondly, Hamtramck used to give a red shut-off notic that had a date. This prevents what happened yesterday, because that were poor let it simply go on the tax rolls. Past conditioning of citizens warranted an official three-day warning to be ethical, legal and decent. This is terrible city. I want to move! I lived in the city from the 60*s until last summer when i got fed up and moved out. Hamtramck used to be the best place to live in metro Detroit,period. Where else could you find the unique flavor Hamtramck could offer? Its now a hollow shell of its former self with the empty store fronts on Campau,the utter failure of past city governments to stand up to the local unions, and tell them we cant sustain the type of pay & benefits you want has put the present city government in such a bad position it had no choice but to ask for state intervention. I love Hamtramck & am rooting for it getting back on the road to prosperity. I just cant do it anymore & am saddened future generations wont be able to see the Hamtramck i knew.